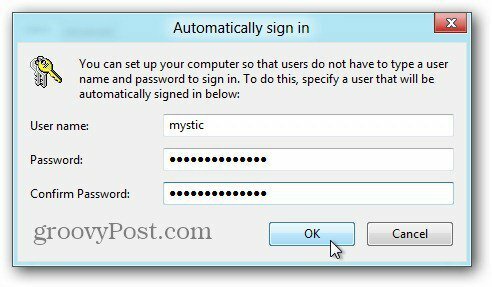 I previously showed you how to disable to Windows 8 Lock Screen and how to speed up your log in by using a four digit PIN. Now, here’s how to log in automatically to Windows 8. 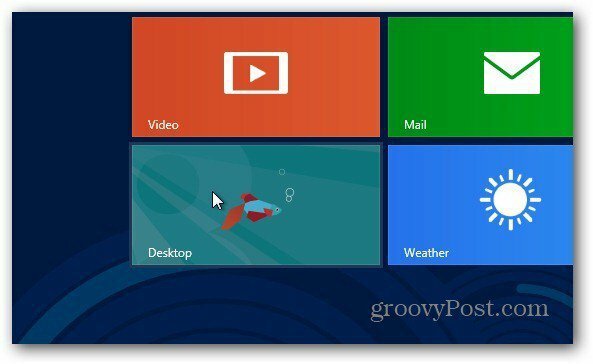 I previously showed you how to disable to Windows 8 Lock Screen and how to speed up your log in by using a four digit PIN – which makes logging into a Windows 8 tablet easy. Now, here’s how to log in automatically to Windows 8. Note: I don’t recommend using this method if you’re using a shared computer, public location or on a shared computer or tablet. But if you’re alone and in a secure location, it makes accessing the data on your device faster and easier. First, log in to Windows 8 and from the Metro Start screen, click the Desktop Tile. 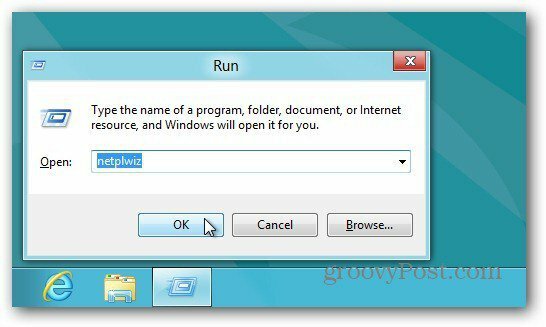 Now use the Keyboard Shortcut Win Key + R to bring up the Run Dialog. Type: netplwiz and click OK or hit Enter. The User Accounts window comes up. Uncheck Users Must Enter a User Name and Password to Use This Computer. 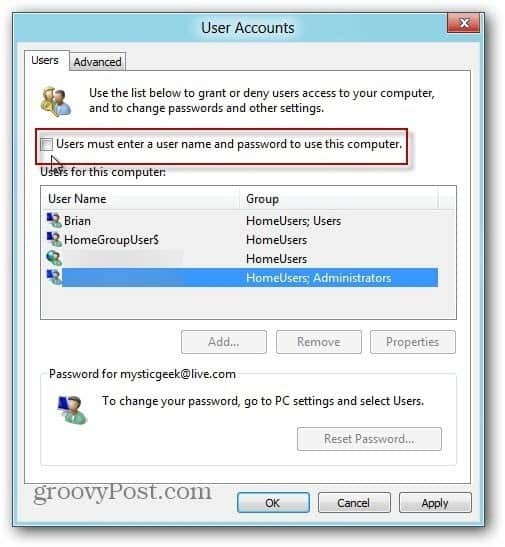 Click OK.
Then enter in the user name and password you use to log into the system. Click OK.
That’s it. Next time you restart, you’ll no longer need to log in with a user name and password first. Again, this isn’t a secure option, so use it judiciously! A very useful tip, thank you.